I am less than a year into my practice as a PT and these are just a sample of the things I hear on a regular basis. I’m sure none of the clinicians whom these patients initially got these beliefs from meant for them to understand it that way. Unfortunately, what we say isn’t always what our patients hear. What we mean isn’t always what they come to understand. Question/discussion topic for all my rehab friends who are into pain science & the biopsychosocial model …. 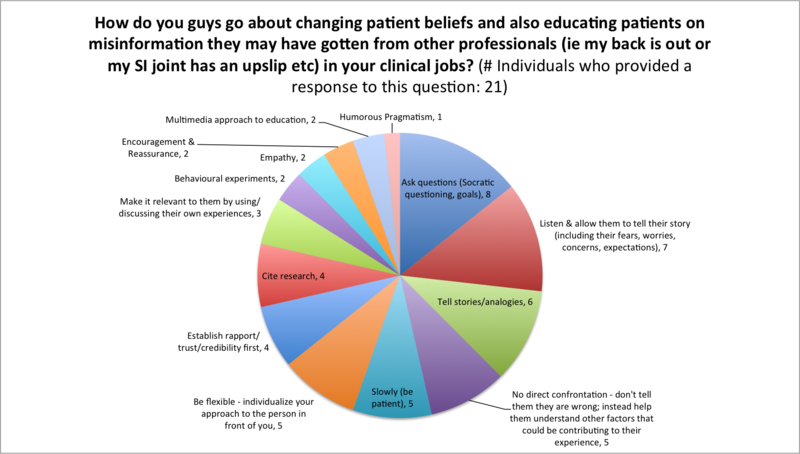 How do you guys go about changing patient beliefs and also educating patients on misinformation they may have gotten from other professionals (ie my back is out or my SI joint has an upslip etc) in your clinical jobs? With the popularity of pain science research and the biopsychosocial model there’s a lot of focus on the role of psychosocial factors in pain and changing the beliefs of people with pain – but I feel there’s a lack of practical information (aside from Gregory Lehman’s and Peter O’Sullivan’s courses/videos/online stuff) out there on how to practically implement this stuff into the clinic. By the time I logged into Facebook the next day, 21 individuals had already provided a response to his question (not including off-topic responses, or responses that don’t directly answer the question). Social media is quite powerful! One person pointed out in her comment: “What I like about this thread is that there are so many different answers. Which supports my hypothesis that there isn’t ‘one’ way. There are lots of ways.” As I was reading through the different answers though, it seemed like there were consistent themes that kept popping up. Maybe it was the engineer in me, but I decided to geek-out a bit and do a rough analysis on the most common themes. I looked at each comment that was made and pulled out a “theme” from it or put it into a theme that I had already identified. The number beside each theme is the number of people who made comments suggesting that theme (note that each person could have alluded to multiple themes so it does not add up to 21). I’m sure this wasn’t up to the standards of qualitative research but it was still interesting to do! It takes time for beliefs to change – it’s not gonna happen in 1 session! If I’m talking a lot, they’re probably not taking much in. I should strive to use Socratic questioning to help them come to their own conclusions rather than me telling them the conclusions. To do this effectively requires listening as well I think. There is no one way to educate – I need to be flexible in my approach in terms of what questions I ask, what research we discuss (if at all), what experiences I try to elicit from them to relate to the educational content, what stories/analogies to use, and what resources I give them. Oh and one more theme as I am reading through some of the comments again: Failures are inevitable. Even Lorimer Moseley tells us about one of his spectacular failures in his book Painful Yarns (The Hino Story). I can think of multiple times where I think I’m getting through to someone, but then they say something that makes me realize that we are not on the same page at all. And occasionally, with enough repetition through different approaches over a number of sessions, we do make a breakthrough! Sometimes, patience and persistence pays off. I think there is a tricky balance between blaming the patient or health care system for our failures (to make ourselves feel better) and blaming ourselves for our failures. I think there is a happy medium, where we take responsibility for improving our teaching abilities as much as we can while not getting too upset with ourselves when we do fail. Sometimes, things are just outside of our control. Overall, I really enjoyed the discussion. It was helpful to read about what other clinicians do to more effectively educate their patients. And nice to know I’m not the only one who struggles with it. Thanks for sparking the discussion Eric! Great post. I also saved the FB thread. Thanks for continuing the discussion Eric started, and geeking out with an excellent summary graphic.